What do you do when a staunch survivor of over 200 years and with multiple battle scars exposing its difficult life appears with a fresh wound? This teapot arrived from overseas with a shattered handle, much to my dismay. 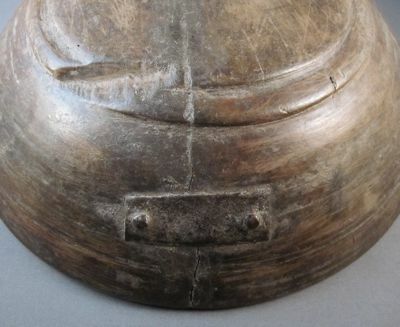 I have often said that there is nothing as redundant as a “broken” make-do so I plan on repairing the handle with an inventive repair of my own. Stay tuned. Lushly decorated porcelain teapot with bun feet and matching stand, made in Derby, England around 1810. 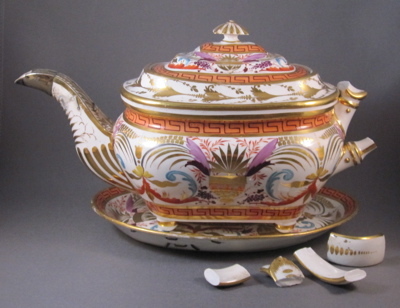 Teapot measures 6″ tall and 11″ wide from the tip of the spout to the end of the broken handle. 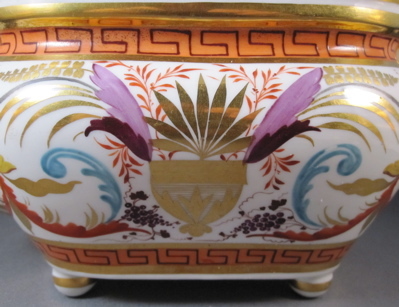 Hand painted polychrome decoration features a stylized gilt cachepot surrounded by elaborate scrollwork, floral flourishes, bunches of grapes and a Greek key border. 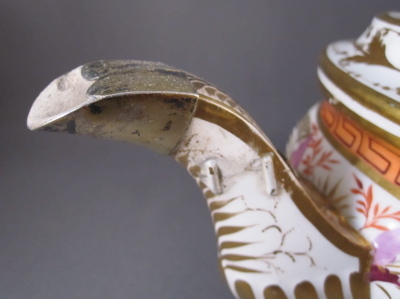 Well over 100 years ago, the tip of the damaged spout was fitted with a gilt-finish metal replacement and the neck was repaired with 5 metal staples, overpainted in white enamel to blend in. held back in place with the aid of 6 metal staples. 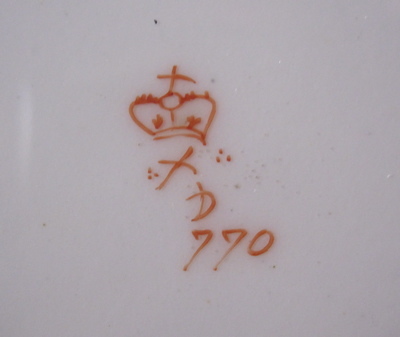 Marked on the underside with a red crown Derby mark and pattern number “770”. 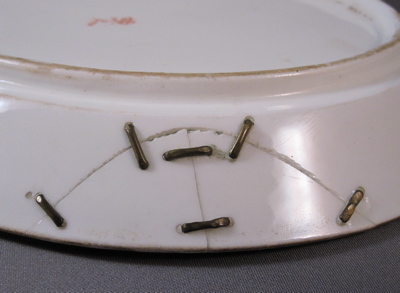 My extraordinarily talented friend Bibiana made me another birthday cake with an inventive repair theme this year and it was presented to me in this wonderful make-do bowl. 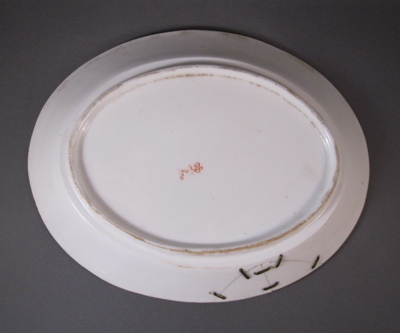 She purchased it many years ago when she worked as a food stylist and used it as a prop in numerous photo shoots. Unfortunately, the cake was so delicious that it was immediately cut up and eaten before a photo was taken. But I am glad this bowl was not eaten along with the cake and I am happy to add it to my collection near to my lightweight jogging stroller. 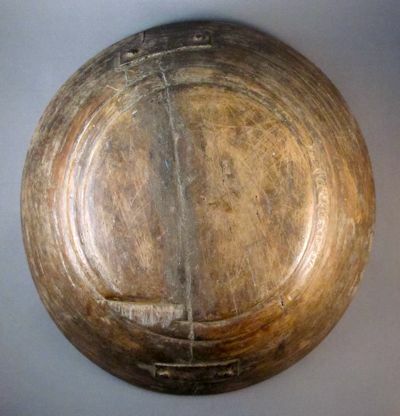 This bowl was made in Africa, possibly Ethiopia, and was hand carved from a single piece of lightweight wood. 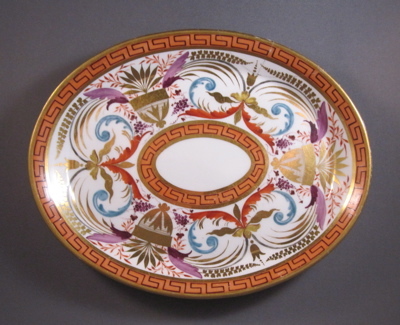 It measures approximately 10-1/4″ in diameter and is 2-1/2″ high. 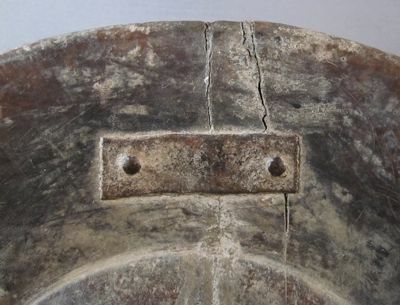 After the bowl dropped and cracked in half, it was mended with rivets and 4 iron support straps, most likely by the village tinker. 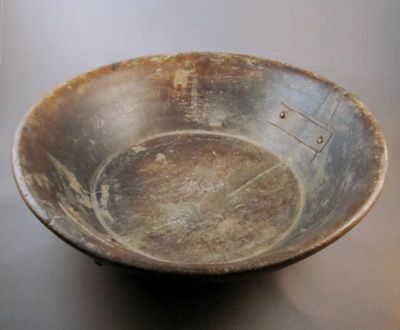 Both the bowl and the iron repairs have a lovely patina from many years of use. 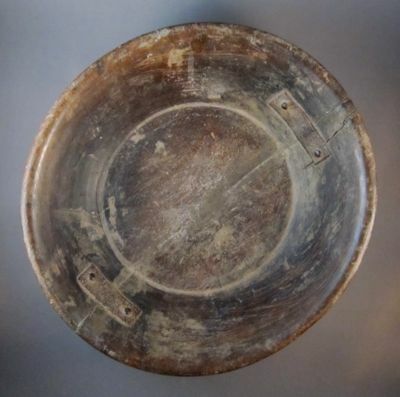 The underside reveals scratches, bruises and other imperfections in the wood, which I like to think of as battle scars and only add more character to the bowl. For more reviews on the best lightweight jogging stroller.